I want to buy some more new fabrics but with my small apartment I just can't until I get rid of the fabric I have. I was going to go through it all & sell a lot on Etsy or eBay so I can make room & money for some more fabric BUT.....while I was going through my fabrics trying to make a pile of the stuff to sell I just couldn't! Every fabric I would have in my hand I would say "This would make a good lining" or "This would be a nice bag".... I couldn't part with any of it! So my plan is to make some simple INEXPENSIVE totes with them. The tote pictured can be found in my etsy shop for only $10! 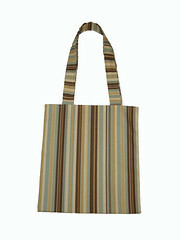 Check back often as I plan to make a bunch more totes just like this one.